Q - Is this a snake takeaway? Sorry about that - it was crying out for a caption! Fab picture Carole - really made me laugh too! Also - its been great to read your thoughts on the whole thing. I completely agree with all you've said. Thanks for that Sue...they *are* really funny. I'm really disappointed that the photo isn't 'real!' 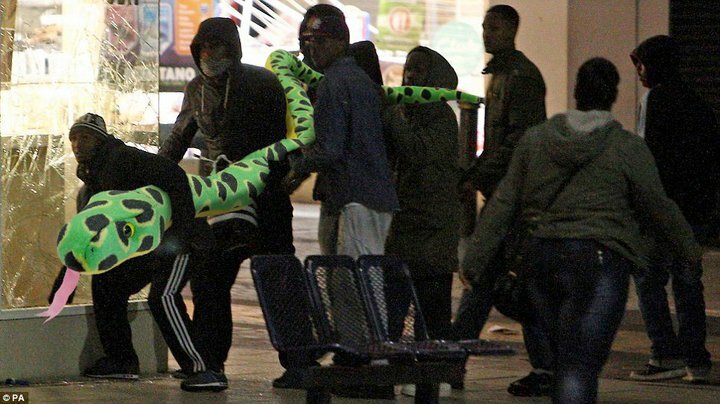 I honestly thought those guys were really nicking a big fat cuddly snake! Lol! Had a look at the website. It's brill. My fave is the Cameron one with no.10 getting looted. LOL Shents! Love the "snakeaway" caption! Some of the looting kids could do with some poisoning with their chips! I did LOL @ the Cameron one, so so funny.